Following a soft launch in late June, we are formally launching our £2 per image educational licensing initiative tomorrow, 1 November 2010. During the soft launch period we have sold over two hundred £2 licences, mainly to historians (national, military and local), art-lovers (both of illustration and fine art) and Bible teachers, but also, for example, to someone giving a lecture on the Panama canal and, even, by special permission, to someone wanting an image to use on the jars of his home-produced jam! Needless to say, we are hoping that, with the benefit of some publicity, we will sell many more licences. In addition to a press release, next week we are mailing out 10,000 free sets of postcards which, as well as showing off a sample of our images, include cards promoting the best of Look and Learn and the Look and Learn children’s art gallery. If you are a supporter of Look and Learn and would like a free set of cards, please email publisher@lookandlearn.com with your name and address (UK addresses only, I am afraid). Look and Learn, in conjunction with Bridgeman Education, has launched a new service at www.lookandlearn.com supplying images for personal and educational use for just £2 (c US$3) per image. Over 200,000 history, art and culture images are now available for immediate download at a standard resolution (1024 pixels high or wide) optimised for digital projection and printed coursework. This is the first time that such an outstanding range of high quality educational images has been made available on a pay-as-you-go basis. The service has been designed to appeal to teachers and students at schools and universities, as well as to individuals needing high quality images for private use. A Look and Learn licence for personal and educational use entitles the purchaser to use an image for any of the following personal, home study or educational uses: classroom teaching (eg digital projection); coursework, either in digital or printed form, including lectures, notes, seminars, essays, dissertations and theses used or presented within a single educational institution and not made available outside; privately printed books up to a total of five copies; privately printed greetings cards or postcards up to a maximum of twenty copies; a screensaver or desktop background on a computer in the home or classroom; a slideshow or background on a television or digital photo frame in the home or classroom. 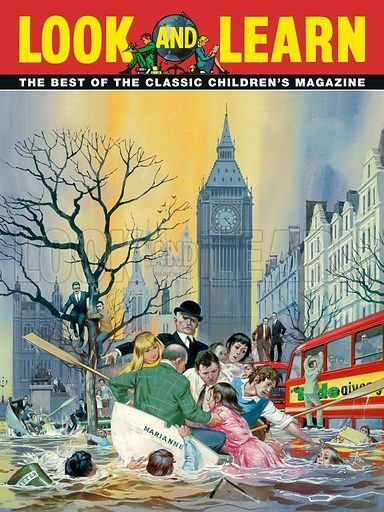 Look and Learn (www.lookandlearn.com) owns the rights to half a million illustrations that appeared in sixteen classic British children’s illustrated magazines, including Look and Learn (1962-82). This material is complemented by illustrations from a wide range of 19th and early 20th century printed sources. Look and Learn also runs monthly online children’s art competitions with the explicit objective of creating the world’s best gallery of children’s art (www.lookandlearnart.com). The educational branch of The Bridgeman Art Library, Bridgeman Education (www.bridgemaneducation.com) provides a dedicated subscription-based service that supports the use of high-quality images in education, be it teaching, research or reference. The Bridgeman Art Library (www.bridgemanart.com) is the world’s leading source of fine art, cultural and historical images. 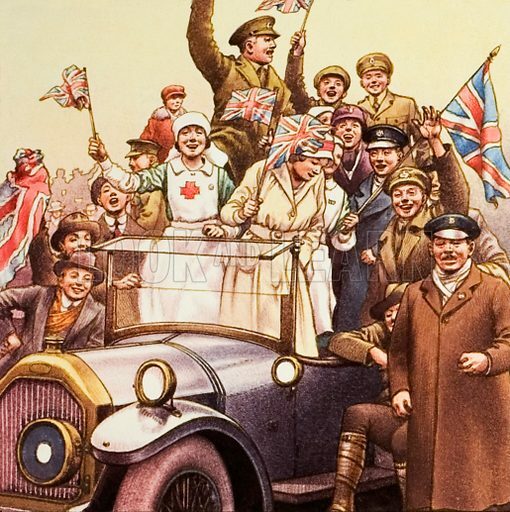 11 November marks the anniversary of the signing of the Armistice agreement between Germany and the Allies in 1918, ending World War I. The Great War had been fought since 1914. In September 1918, the German Supreme Command informed Kaiser Wilhelm II that the military situation was now hopeless and it was impossible to guarantee that the German lines holding back the Allies would hold for another 24 hours. The chief signatories of the Armistice were the Allied Commander-in-Chief Marshal Ferdinand Foch and Germany’s representative Matthias Erzberger, who met in a railway carriage in the forest of Compiegne in Picardie, France. Many more pictures relating to the Great War can be found at the Look and Learn picture library. 11th November marks the anniversary of the signing of the Aboriginal Protection Act in 1869, by the colony of Victoria, Australia. This gave the government power, through the Board for the Protection of Aborigines, over the native people which was used to regulate where they lived and worked, what they could do and whom they could meet and marry. It was used to remove children from their families, beginning the process of what became known as the Stolen Generation. The inhumanity of the Act was finally recognised and much of it repealed in the Aborigines Act 1910 and Aboriginal Lands Act of 1970. 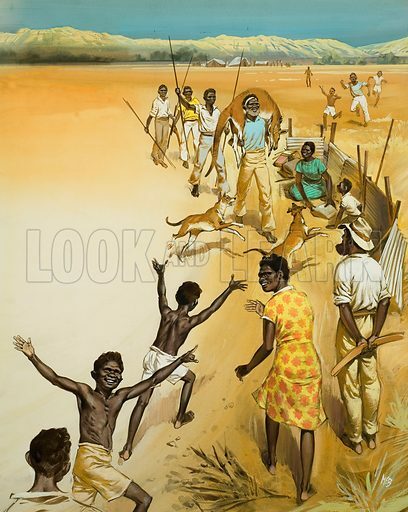 Many more pictures relating to the natives, culture and history of Australia can be found at the Look and Learn picture library. 10 November marks the anniversary of Sir Henry Morton Stanley’s uttering of one of the most famous phrases in history in 1871. After years of isolation in the wilderness of Central Africa, David Livingstone – whose disappearance had attracted the attention of the whole world – was finally tracked down by Stanley. “Dr. Livingtone, I presume?”, asked Stanley as he approached the legendary figure. Despite Stanley’s urgings, the Scottish explorer refused to leave Africa; soon he would press on in an attempt to discover the source of the Nile. Many more pictures relating to David Livingstone and Sir Henry Stanley can be found at the Look and Learn picture library. 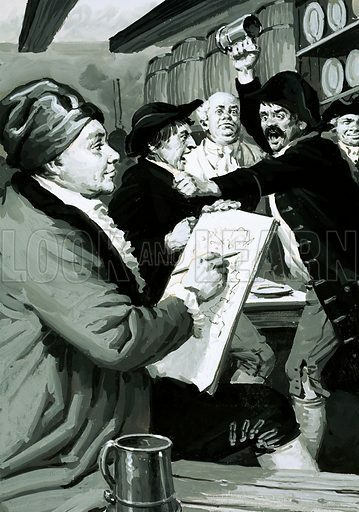 10 November marks the anniversary of the birth of William Hogarth in 1697. Born in London, Hogarth was apprenticed to an engraver and entertained himself by sketching characters and scenes he saw around the metropolis. He became best known for his satirical prints, which made fun of contemporary society. His work became more moralizing in the 1730s with A Harlot’s Progress and A Rake’s Progress and his later works such as Beer Street and Gin Lane and The Four Stages of Cruelty encouraged social change. He died in 1764, aged 66. Many more pictures relating to Hogarth and his works can be found at the Look and Learn picture library. We still have a limited number of complete sets of the best of Look and Learn. As its first editor said, Look and Learn is like one of those fabulous caravans that used to set off to strange and unknown places and return laden with all sorts of wonderful things – containing in its pages all the excitement, the wonder, the tragedy and the heroism of the magnificent ages that make up the traditions which shape our lives. If this is what you are looking for in a children’s magazine, please click here and place your order. To celebrate the launch of our £2 image educational licensing initiative, we are running a competition to identity the artist of the painting below. The prize for the first person to identify the artist is £100. The closing date is 31 December 2010. In the event that no one is able to provide a credible identification with supporting evidence, the prize will go to the person who has most advanced the state of knowledge regarding the painting. In awarding the prize, the decision of Look and Learn will be final. The subject of the painting is Venus and Cupid – on that most experts agree. The problem is: who is the artist? The National Gallery told us they thought it was possibly associated with paintings by Lely at the court of king Charles II and referred us to the National Portrait Gallery. The National Portrait Gallery told us that the painting was certainly not by Lely and unlikely to have been painted in England and, suggesting that the painting was likely to be from the Low Countries, referred us to the RKD (the Netherlands Institute for Art History). The experts at the RKD did not think the painting was done in the Low Countries and, instead, suggested that it might be from France. The experts on French painting whom we have consulted have told us that it was unlikely to be French. One suggested it could be Italian. Most of those who have seen the painting think it is mid 17th century. However, the V&A has pointed out that the use of black silk in earrings was an early rather than mid 17th century fashion. Dimensions: 29.75 inches by 33.5 inches, excluding frame. Apparent indistinct residue of a signature in monogram form in the bottom right hand corner of the painting. The number “97” is painted in large white numerals on the back of the canvas towards the bottom. No stickers or chalk marks. The canvas has been re-lined but not recently. 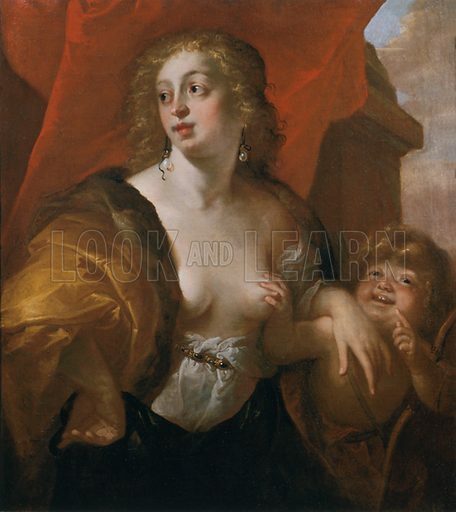 When the painting was recently restored, some re-touching was done, mainly to the lady’s chest. The furniture dealer on the South Coast from whom we bought the painting told us nothing of the painting’s provenance other than that it had come from an “ordinary home”. A number of experts have commented how odd it is that a painting of such obvious quality should so stubbornly resist attribution. But perhaps a more expert expert is reading this and will be able to claim his/her £100. 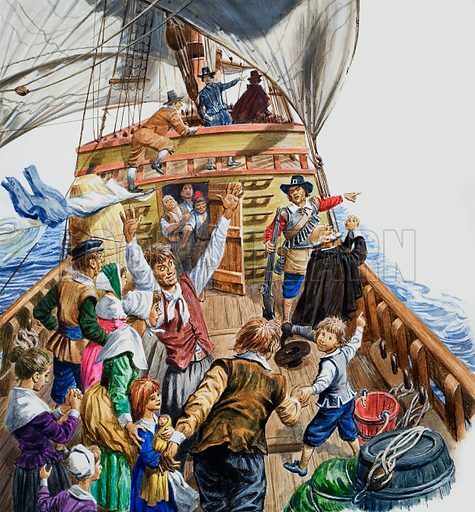 9 November marks the anniversary of the first sighting of land by the Pilgrim Fathers in 1620. Their ship, the Mayflower had been at sea for two months, having set sail from Plymouth in September. The land sighted was Cape Cod and the ship at first attempted to sail around the peninsular but encountered difficulties. Turning back, the ship anchored at what is today known as Provincetown Harbor. More pictures relating to the Pilgrim Fathers can be found here. 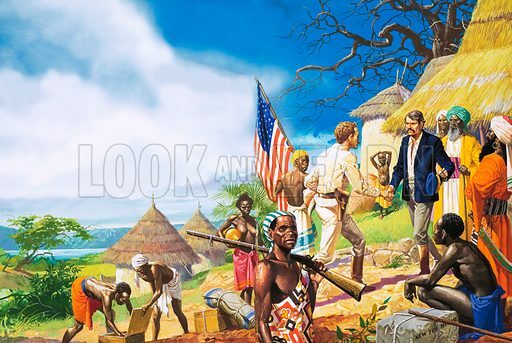 Many more illustrations relating to the history of the United States can be found at the Look and Learn picture library. 9 November marks the anniversary of the death of Neville Chamberlain in 1940. Chamberlain, born in Edgbaston, Birmingham, in 1869, successfully stood as a Liberal Unionist for the Birmingham City Council in 1900. He stood for Parliament in the elections held after World War I and became Chancellor of the Exchequer in 1923-24 and again in 1931-37. He became Prime Minister with the resignation of Stanley Baldwin in 1936. Chamberlain is best known for his negotiations with Hitler and the signing of the Munich agreement in 1938 which he believed would deliver “peace for our time”. The agreement proved to be worthless and Chamberlain stood down in May 1940. He died shortly after, aged 71. More pictures of Neville Chamberlain can be found here. Many more illustrations relating to World War II can be found at the Look and Learn picture library. 8 November marks the anniversary of the birth of Edmond Halley in 1656. Born in Haggerston, Shoreditch, Halley published papers on the solar system and sunspots whilst at Queen’s College, Oxford. He studied and mapped stars and pondered the mystery of planetary motion. 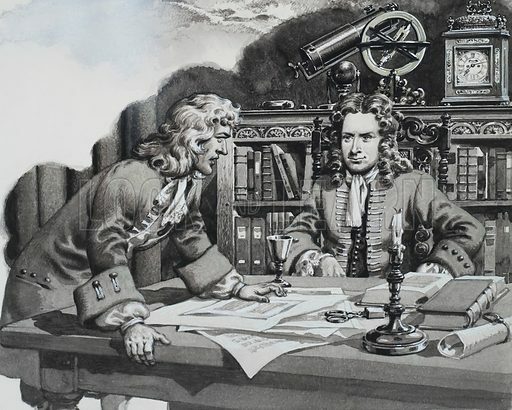 Visiting Sir Isaac Newton, he found that the physicist and mathematician had solved the problem years before but had not published anything. Halley paid for the publication of Newton’s Principia Mathematica Philosophiae Naturalis. Halley is today remembered for computing the period of orbit of the comet which has his name, correctly predicting that it would return to the night skies in 1758 and every 76 years thereafter. 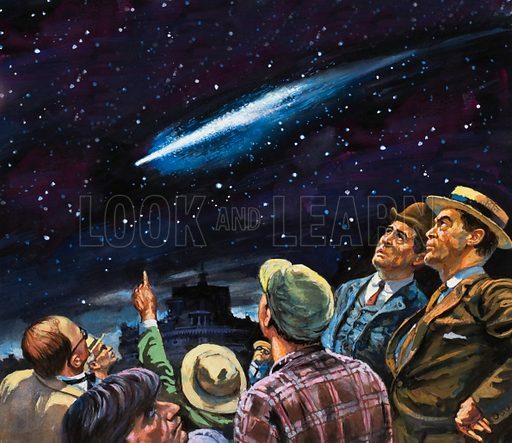 Many more pictures relating to astronomy can be found at the Look and Learn picture library.